US boys love to create and perform. Our students are singers, dancers, musicians, actors, painters, filmmakers and photographers. There is a certain freedom at an all-boys’ school that allows students to feel comfortable exploring their creative and artistic sides. With the visual, musical and dramatic arts playing such a prominent role in our students' lives, the programs at US go well beyond the usual and are recognized as among the best in Northeast Ohio. Today, no boy graduates from US without a two-year exposure to the fine arts. Many students continue this commitment, acting in school plays, participating in the glee club and orchestra, and taking arts electives. Visual arts are embedded in the primary curriculum as boys create art relating to themes they study in the classroom. Working in a spacious studio, students create two- and three-dimensional projects with a variety of media. The middle school visual art curriculum is designed to challenge and motivate middle school boys through both small and large projects that provide ample opportunity for student choice and self-expression. Developing an artistic mindset and focusing on craftsmanship and responsible studio habits are all a part of the middle school art studio experience. Studio projects include painting, drawing, ceramics, wire sculptures, printmaking, mosaics, Claymation, and photography. The upper school's visual arts program includes specialized courses in enameling and metal working, screen printing, and airbrush technique. Beginning and advanced classes in drawing and painting, ceramics, sculpture, and photography are available. Video production, three-dimensional computer animation, and computer graphics are also offered. Upper School students frequently receive local, state, and national recognition through their participation in the annual Scholastic Art Competition and the Ohio Governor’s Show. In the lower and middle schools, boys express themselves through singing, movement, and playing brass, string, or woodwind instruments. In the lower school, a junior choir, recorder ensemble, and a drumming group complement a fun and challenging Orff-Schulwerk program. In the middle school, boys learn music through rehearsing and performing a repertoire that encompasses an array of styles, composers and diverse cultures. Boys also study components of theory, history, composition, and other musical disciplines through project-based learning and collaborating with their peers. Boys in grades 6-8 also have the opportunity to join the Middle School Chamber Orchestra, Jazz Ensemble, and/or High Tops Choral Ensemble. The Upper School offers a diverse music program. The US Orchestra performs a range of pieces appropriate to the technical capabilities of the students. The 1:00 and 2:00 Jazz Ensembles and the Jazz Combo expose students to a variety of jazz styles and the challenges of ensemble playing. The jazz band has traveled to New Orleans and performed throughout the city several times. The US Glee Club is one of the school's oldest organizations dedicated to high quality choral singing and superior musical education for its members. The group performs several concerts each year and has toured throughout North America and Europe. 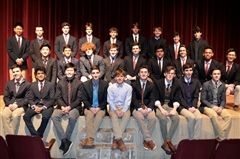 The Upper School Singing Ensemble is known as the US Males. US Males perform contemporary college-level a capella music. The drama program offers a wonderful venue for boys to explore their social and emotional depths, focusing on theatre as a global hub, character development, public speaking, and self-expression. Boys in grades 5-8 explore their creativity and delve deeply into their imaginations in drama class. The program believes in giving students a wide range of experience and instruction in which to develop their skills through scene work, monologues, improvisation, and much more. After school, the department stages two major, co-educational productions each year, a fall play and a spring musical. The upper school drama program, recognized as one of the best in Northeast Ohio, provides students with opportunities to develop as actors and to gain greater self-confidence. The program proudly counts numerous Broadway and Hollywood actors among its alumni. Courses are taught in the creative and technical aspects of theater. Several major productions that go well beyond that of typical high school shows are staged each year and often include girls from area schools.